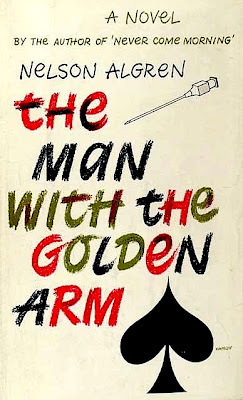 Bookride: The Man with the Golden Arm. 1949. Nelson Algren. 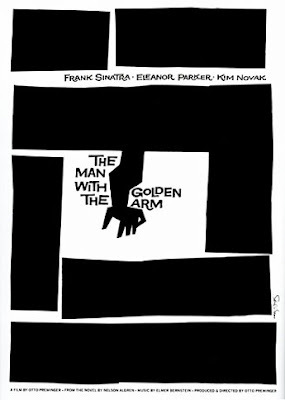 THE MAN WITH THE GOLDEN ARM. Doubleday & Co., Inc., Garden City, NY 1949. VALUE? Decent clean copies can be had for less than $300, very sharp copies a little more. Quite a few signed copies for sale, almost an abnormal amount--some authors are very free with their signature, some costive--Graham Greene used to say he would like to sign but he would be lowering the value for all the books he had already signed - a lousy excuse but perfectly logical. When Algren told Newsweek in 1956 "...Never play cards with a man called Doc. Never eat at a place called Mom's. Never sleep with a woman whose troubles are worse than your own...' It is possible he was referring to Simone de Beauvoir whose lover he had been in the late 1940s and 1950s. I was fortunate in the late 1991 to pick up a bunch of signed presentations from Algren to de Beauvoir on the stalls outside Shakespeare and Co in Paris. In 'Chicago City on the Make' (1951) he had written 'For Castor avec amour from Nelson in the Forrest Ave nest Oct 1951'. In a copy of 'Somebody in Boots' (1935) Simone de Beavoir had drawn two rabbits and and written under one 'Madame la Tigresse' and Algren had written under the other 'Monsieur le Tigre.' The pick of the bunch was de Beauvoir and Sartre's copy of Algren's hardboiled novel 'Never Come Morning.' Sartre and Algren were lovers of Simone concurrently and although Algren presented a tough guy image he found Sartre warm and charming (but he descibed him as looking like a shoe salesman.) Sartre and De Beauvoir had partly translated the book and many of the notes were in their hands - a triumphal airpunching find translated into a goodly four figure profit. Mais ou sont les neiges d'antan? "... in Nelson Algrens version of the dark night of the soul it is always raining day after day and the rainbow sign is always neon Although he wrote about a circumscribed world of bars brothels prison cells and rented rooms Algren transformed the jukeboxes and neon signs of the wild side into an iconography bearing religious implication and existential universality... A jukebox running down in a deserted bar is the way the world ends..."
Thanks for the info on first editions. I hope that you kept facsimiles of the notes in Somebody in Boots.